Quiz: Are You a Coffee Snob? How far will you go for your love of coffee? Coffee culture has infiltrated almost corner of America. This is either the culmination of your caffeine-fueled fever dreams or the bane of your existence. Which is it? 1. You’re out of coffee filters. How do you react? A) Nothin’ Charmin can’t fix! B) Run to the corner store and pick up a box. C) Actually, you never run out of coffee filters, because the 14K gold plated, etched metal filter you bought to maximize the aromatic oils in your daily cup is reusable. 2. What is a flat white? A) A particularly vicious breed of shark. B) Your favorite shade of Benjamin Moore paint. C) A type of latte made popular in New Zealand, topped with foam from the bottom of the milk pitcher for a finely-bubbled, velvety texture. 3. 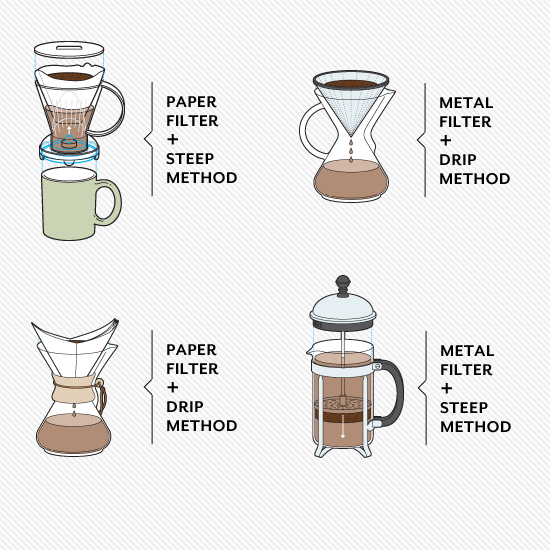 The correct temperature for water to brew coffee is? A) Your Nespresso knows that so you don’t have to. C) 93.3 degrees Celsius, preferably distilled by reverse osmosis. A) Load up on the Solos and Natty Ice. Drinking games are your specialty brah! B) Decline. Isn’t that a weird massage thing Gwyneth Paltrow is into? C) Start hydrating so your palate will be prepared to pick out nuances of licorice and hickory smoke. 5. How do you grind your beans? A) Um, don’t they just come like that? B) Running that big red machine in the grocery store is your favorite part of shopping. C) By hand, in a burr grinder. Your grinding arm is getting jacked, but you start to quiver at the thought of having guests over for breakfast (even the aroma of freshly ground espresso can’t overpower that much sweat smell). 6. Who is your coffee soul mate? A) Start furiously pumping chocolate syrup into a Big Gulp-sized cup and brace the whipped cream guy. B) Sigh with relief. One drip coffee, comin’ right up! C) Cringe and try to hide behind the La Marzocco. A repeat of last week’s double ristretto disagreement is going to end with somebody getting scalded. 8. Some coffee companies believe there is such a thing as “too fresh” and will allow their newly roasted beans to rest for couple of days before serving. A) Does this mean those beans in your freezer from last year are going to be like, extra delicious? 9. Why is there a line out the door at your favorite coffee shop? A) The hot-dog rotisserie caught on fire and short-circuited the French Vanilla Mocha dispenser. B) It’s finally Pumpkin Spice Latte time! C) Everyone knows Kyoto-style drip takes forever, but it’s worth the wait. 10. What are your thoughts on Kopi Luwak, the extremely expensive coffee made from beans that have passed through the digestive tract of an Indonesian jungle cat? A) If you wanted to drink cat poop coffee, you’d stir some Folgers into Snowball’s Friskies. B) You just bought a batch! Your book club is going to be so impressed this week. C) Everyone knows Kopi Luwak is overrated. You are, however, waitlisted for the new micro-batch from Tim Wendelboe (hey, if it’s good enough for Noma….). Mostly As: You're a $1 coffee-drinking anti-snob. Mostly Bs: Drip or doppio, doesn’t matter to you as long as it’s hot. Mostly Cs: You know your stuff, but somewhere out there, a barista has a burn book with your name in it.